Finally, you can enjoy an easy to set-up tabletop version of Shuffleboard and Curling! brings to you one of the best value 2-in-1 bundles of traditional games that can now be enjoyed anywhere and anytime by adults and kids alike. Players will undoubtedly immerse themselves in the fun and challenging gameplay of Shuffleboard and Curling, allowing them to test and improve hand-eye coordination with a competitive spirit. The board size measures 44 5/8"X 12 7/8"X 1 1/4". This premium built Shuffleboard and Curling bundle is perfect for making game night and BBQs a memorable hit! 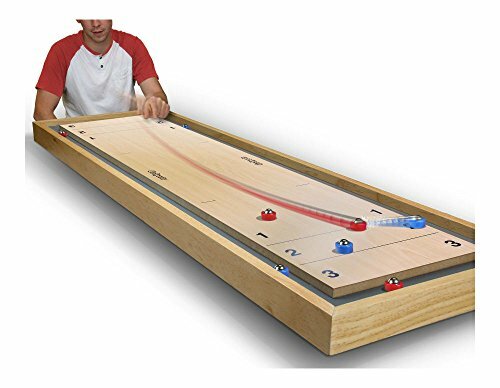 2 GAMES IN 1: Premium tabletop Shuffleboard on one side and Curling on the other!